Graphic changes, placement fixes, new melee weapons and secret stuff. Alex is working on improved sounds for rain hitting objects and lowering ambient volume when you're inside. Andre is working on his first pass at a new, better performing decal system. Improved performance during gunfights? Yes please! 7/8 @ 1:30pm EST - A quiet day for commits so far: 2 graphical tweaks from Diogo and Tom did an update to the survey charge (although it still looks the same as of this moment). One of the reasons progress this week appears a bit slow (besides Garry being gone) is because certain commit logs are not being released. The team at Facepunch, who is normally pretty transparent with what they are adding to the game, has decided to keep some secrets this week. What the hell could it be? It appears we won’t know until it’s live in the game later this week (but I’m keeping my eyes peeled on the development branch). 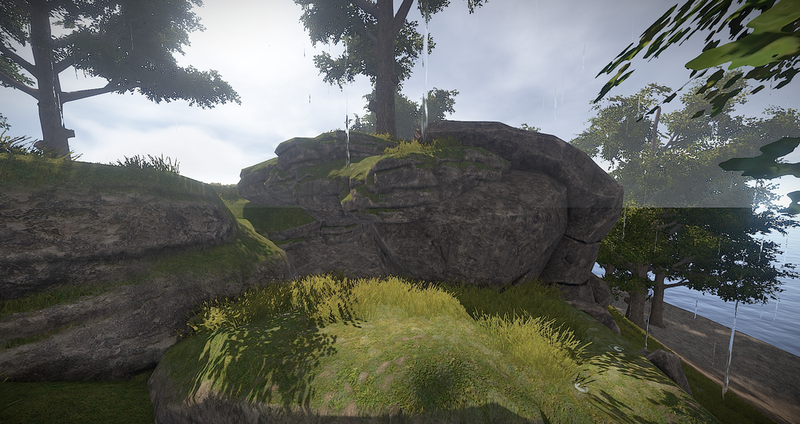 Diogo has been working on a bunch of fixes, tweaks and enhancements for the underlying graphics of the game. Many commits are pretty cryptic (i.e. “Named some command buffers; profiling stuff”), however, some clear fixes are being made (such as the ability to actually toggle lens dirt and high quality bloom off in the F2 menu). Overall, what’s most exciting is it appears some of these changes have improved client FPS. Andre has been doing some fixes to placement around the game. First, he has tweaked the building placement guides for the cupboard and research table so they are no longer rotated in the wrong direction. Next, he’s fixed various issues when placing building blocks in caves. Minh has been working on various player animations. He’s finished all the animations for crouched turning and also added animations and sounds for when you get snared in a snap trap. Helk has completed a couple fixes for landmines. Specifically, he’s made it so any landmine placed on ore will detonate if the ore changes shape (currently, they just continue to float where they were). Vincent has tweaked sandbag barricades, lowering their height slightly. Don’t worry, they still provide pretty good protection when ducking behind them.